Here’s a little story about what my daughter did this past weekend. Let me go back a few weeks and catch you up! Right before Christmas, one of my daughter’s best friends, who is an all star competitive cheerleader, suffered a broken elbow. We join the story when my daughter was called in to be her fill in. We embarked on this all star competition cheer journey not really knowing what to expect, but blindly went forward. Seriously, we were basically blind going forward into this venture, we didn’t know what to expect and just kept putting one foot in front of the other… I had a couple of moms on speed-text dial helping me navigate signing waivers, getting to multiple practices, getting a uniform, getting a team warm up suit, making travel arrangements for out of town competitions at big named competitions like Athletic Championships, NCA, Cheersport, etc. All this within a month of beginning and that was the easy part! The harder part came in the form of my (shy) daughter going to the first practice in a gym the size of a few football fields, not knowing the coaches or even most of the team, picking up where girls (who had been there since April that year) had left off, learning the choreography, learning the pyramid, doing tumble passes, getting sore, getting tired, but in all of this looking forward to the glory of competing after weeks of hard work! Her first competition arrived and she was ready! All of the details we could control were in place, the right hair, the right makeup, the uniform, the energy, the drive… I watched them compete and actually “saw” only one cheerleader on that stage. Isn’t it funny how when parents are watching their own child, all else fades and fuzzes out into the background? She nailed it! It was perfect! The awards came and they announced that our team got… 2nd place. Not only did they get 2nd place but they only missed 1st place by a half of a point. Yes, we walked back from the event to the hotel and focused on congratulating our daughter on a great first competition, she had done a beautiful job! Back to the gym, back to the practice schedule, more work, more preparation. The next competition arrived. The awards came and they announced that our team got… 2nd place. Again, same conversation–Great job! You looked perfect! But of course, 2nd place is not 1st place and that is the prize we all set out to achieve when we compete. Competing is as old as time and for the very fortunate among us, that first place, that personal best, that glorious moment when your name is called above the others is a moment you never forget. We all have that champion inside of us filling us with hope, drive and determination to succeed. Don’t quit, don’t give up, don’t stop trying! 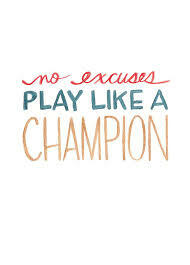 It is that champion in us that propels us to be the best! I bet all of you can remember that one game that you played and in the last second your team scored the winning goal or that race sprinting to the finish and your foot crossed the finish line before your opponent, or how about when you hit that ball out of the park and ran in the winning run over home plate! Cheers, high fives, hugs! The thrill of victory is what makes all of the practice, all the sore muscles, all the harried scheduling worthwhile. All of the times that the ball bounced out of the hoop instead of fell in, the times when you get tackled instead of running the ball into the end zone, the times when the swimmer in the next lane touches the wall a half of a second before you, those are the times when the thought of the win keeps you going. You practice, you prepare, and you know that the winner is in you! So, last weekend our cheer team goes to one of the biggest cheer competitions in the country. I think there were over 950 teams competing! Now, that is big!! Our team had practiced, had prepared, and we knew that winner was in each one of them. This particular event is a two day event where each day counts as as 50% of your total score, when they announced that my daughter’s team was in 1st place for the first day, we were ecstatic! Day two comes, and the team showed its preparation, its perseverance and its drive for winning with an outstanding performance! The girls (& boy :)) sit at awards, listening, holding hands, silently praying, while they announce that our team got… wait for it… 1st place!! It was thrilling, they were elated, overjoyed, triumphant! They had done it! They had the winner within and were able to show it to the world! I know they say that winning isn’t everything, and I believe that, but when you are in that moment where you are the champion, you are the one and only number one, there is no other feeling like it on earth! So, congratulations to the winners of the games, the winners of the races, the winners of the cheer competitions, we rejoice with you- You are the champions! This entry was posted in Uncategorized and tagged athletic championships, broken elbow, OUR MOMENTS, sports, star competition. Bookmark the permalink. Thank you my love! I love you! Thank you for including me, I loved this blog! (: and you and family! And god and Jesus! YOU are always included 🙂 and I love you very much!